New Year has arrived, with lots of new challenges and strategies. You must have taken some new year resolutions, definitely I can’t help you learn french nor I can let you finally join the gym. But if you want to raise your Business in 2016. 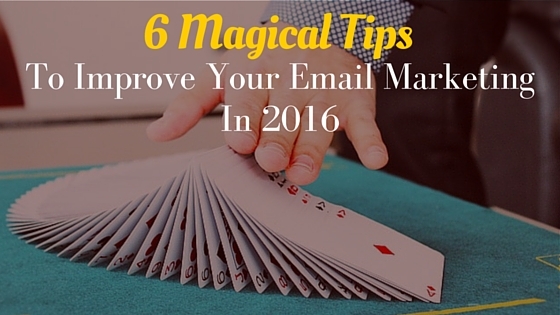 I have 6 tips which can let you refresh your Business in this new year with Email Marketing. Sometimes, it’s good to look at past to enhance your future. If you want to overcome all your gaps in your marketing strategies, you have to first look up to your past, which idea proved best for you and which was the worst. All you have to do is to take a cappuccino and a morning to comb all email 2015 strategic reports. Subject lines worked the most, the open rates of your subject line, which type content generated most clicks? What you have to achieve in 2016. Strategy for how to achieve it. Set your benchmarks. Be clear about yourself how achievement looks like. 20% increase in subscribers. 10% increase in click rates of your emails. That’s your call. Not segmented yet?? start segmenting your emails in this new year. Remember your mail box, the mails that are in unread box was not seen of your interest right? Sending the same email again in 2016 know as Batch and Blast email are going to be less and more less effective. Start a new campaign to know what your customers want in this new year or start segmenting your subscribers based on what you already know about them. Grab the data from your website in which they have answered your questions to get registered themselves. Most simple, you can track the behavior of your customers toward your emails or newsletters or website content by tracking their interaction for these. Apart from this, if you want more clicks then you have to serve efficient content which will save your customer’s time. Their mailbox is already getting flooded with unread mails. Give them a reason to make you their priority. More than half of emails get opened in mobile devices. 64% of decision makers read their emails via mobile devices. 48% of emails are opened on a mobile devices. Statistics is enough to describe how people are including their cell phones in their business. After all, nobody would like to open his laptop every time to check their email if he can do the same by just scrolling his thumb. These percentage are getting grow in 2016. if your email design is not optimized to display properly on mobile devices then sorry to say, but you are going to receive a huge chuck from your customers. Emails and Social Media are two different faces and always remains in conflict. But beyond this conflict you can take use of Social Media to increase your Email list. Using only just Social Media to promote your marketing is definitely not a smart idea but using Social Media to enhance your Email Marketing will work smartly to increase your subscribers, your email list, your clicks and what not. For matching up your email and social media you not need to become a digital marketing champion. These five steps are enough to increase your subscribers. Promote your Social Channels and let people join you Newsletters. Let them follow you by providing small icons below your content. Use your Facebook Post’s fan to grow your subscriber list. Facebook isn’t the only social giant. Create Twitter campaigns and add you promoters. How great you’ll feel when you will find that after making purchase you got a Thanks Mail. So do your customers. But hiring people just to say thanks doesn’t sounds as a smart marketer. Be smart and start using email software to send pre designed emails in response to certain activities of your customers. In 2016 automation software is going to get smarter and marketers are going to get more innovative. So you have to start the race of getting more innovative and attractive mail for your customers. Start a new year with a new habit. The worst thing about improvement is it rarely just happens. So, in this new year make a monthly or quarterly review system whatever suits you the best. Regularly checking your email progress, their clicks rate will definitely help you in making some new strategies and will help you in your marketing improvement. Review your 2015 email marketing statistics that what worked? What didn’t? And decide your goals for 2016 Email Marketing. Look for all new ways to segment your email subscribers. Make your emails accessible by everyone by optimising it on mobile devices as well. Use your Social Media Channels to enhance your Email Marketing. Keep automation touch with your customers to let them feel that they are special for you. Set up weekly Monthly or Quarterly meetings to check your email marketing progress.